Na Nach Nachma Nachman Meuman: Sent to Human Chain org. Sent to Human Chain org. To the bystander this idea seems un-halachic, a waste of resources and impossible at best. If this were really the case, I would not be in my 18th year of trying to get this accomplished. Everything about this project is "mind blowing" for example, you have guys going to Uman as if their life depended on it and others dancing 24/24 in the streets and they are doing this unaware of the significance of this project. If they don't understand why Bringing Rabbi Nachman to Jerusalem is so important why should you? 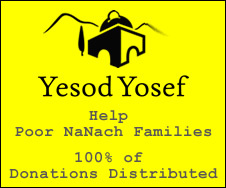 Because the project is so vital to Peace on Earth (and beyond..yes) I have begun a charitable account where the money collected is kept until the sum of 70 000 NIS is reached at which points Politicians, Officers, Business Moguls, Rabbis and Professors will gather with anyone who contributes on a regular basis to decide how to advance this project. If I tell you about the significance of this project, I would need to repeat facts over and over because none of this is anything you have ever heard before. It connects divinity to our lives in a scientifically tangible way and most people want to ignore the truth, for this reason keeping the information discreetly in order to spare people from the wrath of G-d is a wise move. The way to skip Armageddon and enter the promised state of the world through the mercy of G-d is in fact very clear. It requires 600 000 Jews keeping their oath made to G-d in front of Josef, that's all. It is all about keeping the word. When Rachel cried 20 years she received Josef (Likutey Moharan Tanyana 67 last line). For Benjamin she didn't cry. She called him "average" not "more than Josef a different son" and Jacob took him as his own right hand. Rachel begins crying after she dies...3000 years until "nachamo nachamo ami ish lo needar"
Truly there is enough to write a book about this. Please answer this email how can we help each other?? ?